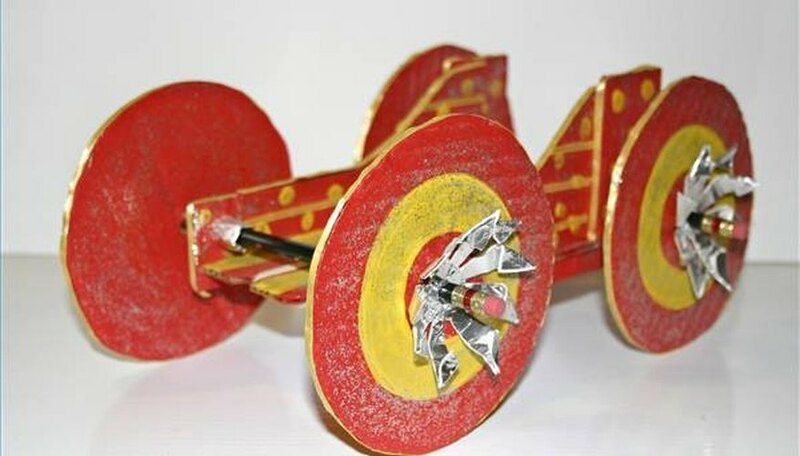 Building an elastic-powered car out of cardboard is a fun rainy afternoon project for kids. Chances are most of the supplies you'll need are already around the house. Build a car for each child and stage racing competitions in the hallway. These cars really scoot. Design and trace the left and right side of a car template on cardboard, making sure both sides match up in size and shape. A good size to work with in fabricating a cardboard elastic-powered car would be about 8 inches long and 3 inches tall. Draw four circles of about three inches in diameter each on the cardboard. Cut out the templates for the car body and wheels. Decorate the car sides and wheels if desired. Get the wheels ready to roll. Punch axle holes in the car body about half an inch from the bottom edge and two inches from the front and back bumpers. Punch a hole through the center of each wheel and insert a # 2 pencil or wooden dowel of the same diameter to use as axles. Insert the front axle through the two halves of the car body and attach a wheel on the opposite side. Glue wheels to the axle. Insert a third pencil or wooden dowel through the center of the car body and affix a heavy rubber band at least four inches in diameter over the dowel. Secure the rubber band by making one twist to form a figure 8, then place one loop of the rubber band through the second loop around the dowel. Pull tight to secure. Place the rear axle through one side of the car body and loop the free end of the rubber band over the middle of the rear axle. Push the axle through the other side of the car body and secure the remaining wheel with glue. Reinforce the cardboard car body around the two axles and the center "engine" dowel with strips of cardboard above and beneath the holes. Secure the cardboard with glue or tape. Make sure the axles spin freely around the car body. Hold the center dowel steady and turn the rear axle counterclockwise to wind the elastic band around the axle. Hold the axle in place with a finger on the dowel beneath the car. Set the vehicle gently on the ground and release. Visit ClassicCar.com for design ideas.